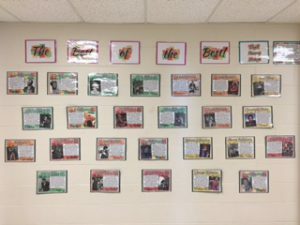 Grade 5-8 students have been exploring the roots of popular music known today through influential Black artists of North America. Grade 5 students are exploring movement songs that are now considered popular children’s songs such as “Pick a Bale of Cotton,” which were originally worker songs for those working in the cotton plantations. Grade 6 students are learning about the use of secret codes through slave songs and stories to find escape through the Underground Railway. Songs such as “Follow the Drinking Gourd” and “Wade in the Water” are learned and performed as in classes as students analyze the lyrics and historical references. They are also learning more about Martin Luther King Jr.’s dream by creating a soundscape for the storybook, “Martin’s Big Words” which revisits the day they marched for civil rights and freedom for all people. Grade 7 students are learning the history of the blues and how its roots are related to slavery. They are studying the biographies of great Blues artists such as Muddy Waters, BB King, and Memphis Minnie, and students will get the chance to listen to their work. Students are also listening, reading and learning about their unique contributions to the many Blues styles known today and the chord progression that have become the foundation for R&B and Rock’n’Roll. The Grade 8 students are learning about the history of Rhythm and Blues and how this new form evolves into a new and fresh look at dance-able, fast-paced music that would influence future rockers to come. They are learning about the Black artists that originally wrote many of the songs popular today such as Little Richard, Chuck Berry, Ray Charles, and more. In the photos, Grade 7 students are learning the C Blues Scale on the recorder, Grade 6 students are playing xylophones and percussion instruments singing Wade in the Water (slave coded song) and Grade 5 students are singing and playing a Zimbabwean children’s song called “Sorida”. Previous Story Previous post: New Upstairs Fountain looks refreshing! Next Story Next post: Carnival/Carnaval/Carnevale was a huge success!